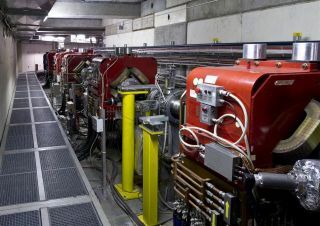 A photo shows the antiproton decelerator at CERN. Until now, the list of things that travel in vans has pretty much included indie bands, plumbers and undercover surveillance teams. But, according to a report published online in the journal Nature today (Feb. 21), physicists are getting ready to pack up a cloud of billions of antiprotons for the journey of a "few hundred meters" between the physics lab CERN's antimatter factory and the site of an experiment designed to figure out the shapes of bulky, radioactive atoms. Antiprotons are rare but hugely important particles. Every matter particle has an antimatter twin, like the Jekyll to its Hyde, with exactly reversed physical properties. And antiprotons are the bizarro versions of protons, the positively charged particles at the center of atoms. When they collide with protons, they annihilate each other. And those collected antiprotons can be useful. Researchers don't know, for example, exactly what the nuclei of big, radioactive atoms look like. A heavy isotope might contain dozens of protons and neutrons, and physicists have long known exactly how many of each there are. But they generally don't know how those particles are arranged. Are the protons clustered in the center, surrounded by a shell of neutrons? Do the neutrons orbit in a surrounding halo? For a project called the antiProton Unstable Matter Annihilation (or PUMA), Nature reported, researchers plan to fire antiprotons at atomic nuclei and, by studying the annihilations, figure out how often those antiprotons collide with neutrons and how often they collide with protons. That will tell them a great deal about where each kind of particle lives in the nucleus. The process happens so fast that they expect to be able to study even the most short-lived nuclei — extremely heavy elements that exist only in laboratories for brief moments before decaying — Nature reported. But to pull off the experiment, the researchers need to bring the antiprotons to the nuclei. To that end, they intend to magnetically trap large clouds of them — enough to last for weeks on end — in vacuum chambers, load those traps onto vans and drive them the short distance to the experiment site. It's a short journey, but a first for the exotic particles.